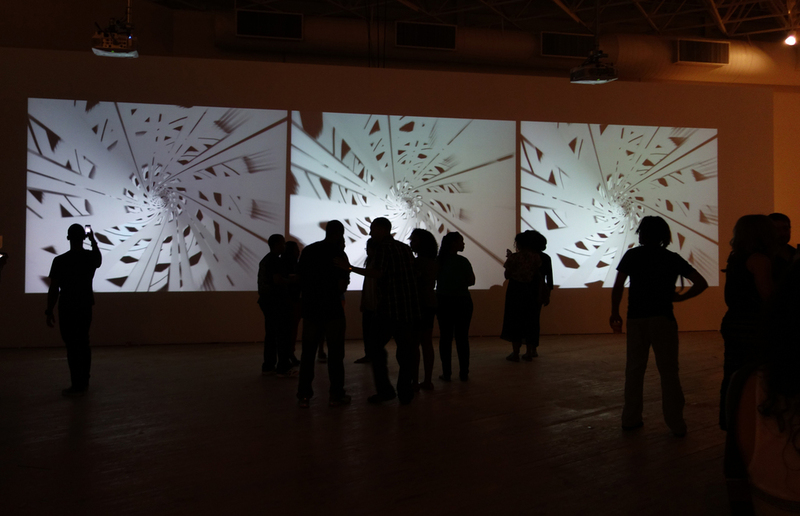 Excerpted from i I i, a 3-channel networked video installation by NoiesFold, AKA Cory Metcalf and David Stout. Video document taken from i I i, a 3 channel networked video installation by NoiseFold. i I i is a three screen networked video installation exploring 3D data feedback and delay techniques to fold, crumple, and blend simple planes and spheres. The resulting images, resembling complex objects made of paper or fabric, are further revealed through the use of video skins that cut away both inner and outer surfaces. Organized in the form of a triptych, the center screen controls the image generation of the outer satellite screens. The work recycles approximately every 60 minutes, though never repeating in exactly the same manner.